The World Wide Web turned 29 on March 12, 2018. In this relatively short period of time, “going online” has become an integral part of many Americans’ daily lives – at work, at home, and at leisure. We now have a generation of consumers who never know life without being online, and even older segments of the population have incorporated the Internet into their routines. From the PC as geek “toy”, desktops, laptops, mobile phones and tablets have evolved into essential tools. Consumers routinely seek out audio and editorial content online. Ever-faster connections have led to the rise of online as a primary vehicle for video entertainment – to the point where the computer and mobile devices are now referred to as “second” and “third screens” respectively. The vast majority of Americans - 95% - now own a cellphone of some kind. Adult ownership of cell phones has also soared: Cell phone penetration 73% penetration in first survey in 2006 95% in 2018 Smartphone ownership 35% in first survey in 2011 77% in 2018 In 2018, 89% of Adults 18+ use the internet, which accounts for roughly nine-in-ten adults using the internet. Smartphone owners by age: A18-29: 94% A30-49: 89% A50-64: 73% A65+: 46% 20% of US adults are smartphone only internet users. Cost Efficient: Inexpensive to buy compared to traditional electronic and print media. Connectivity has become a lifestyle for the American consumer, Increasing availability of quality information, entertainment, audio, and video content keep users coming back for more, expanding opportunities for online advertisers to connect with them at all hours of the day or night. Engagement: Consumers are active participants in two-way interaction with both content and advertising online. Users are already online, easily directed to an advertiser’s website. Flexible and Unique: An advertiser can put up a mass-appeal direct-response ad or a slick, produced video – and, unlike TV, online video ad lengths are flexible and not required to fit into commercial pods. Trackable: Electronic measurement is very precise. Advertisers can track which PC was “exposed,” which clicked through an ad, and what else they were exposed to during an online session. The internet is unique among all media in affording follow-through sales response. Technology now allows specific ad messages to follow users from site to site. Mimics TV: Digital sellers are increasingly offering daypart, day-of-week, cost-per-click and GRP-based advertising models, beyond direct response tonnage buys of early days. Additionally, TV-style commercial advertising units are increasingly available, extending exposure and awareness of creative. CPM modules and Reach/Frequency data is extending into the marketplace. As the adoption of traditional broadband service has slowed in recent years, a growing share of Americans now use smartphones as their primary means of online access at home. Today one-in-five American adults are “smartphone-only” internet users – meaning they own a smartphone, but do not have traditional home broadband service. Reliance on smartphones for online access is especially common among younger adults, non-whites and lower-income Americans. In 2018 about 20% of US adults who do not use broadband at home own smartphones. Immediacy: Advertising messages on both radio and the Internet reach consumers immediately. Radio ads reach many listeners at a single time, while online ads present themselves when the user decides to log on to the ‘Net. Exposure to advertising on both is complementary and will reach consumers at times when they might not have access to one medium or the other. Increase Reach: With a variety of formats in every market and national networks also delivering programming directed to specific demographic or interest groups, Radio allows advertisers to zero in on large numbers of consumers in the age demographics and socio-economic characteristics they need to reach to successfully market their products and services. While Web sites also deliver niche markets, many are small and users are not all on the site at the same time. Radio supplements the somewhat narrower reach of most Web sites, resulting in effective exposure across platforms. Timing: Radio spots air at certain specified times designated by the advertiser. Digital advertising’s timing is more random, reaching the consumer at whatever point they log on to devices. Each has the capability to remind consumers of the other and reinforce messaging impact. Cut through the clutter: Radio has done an effective job of cutting down on commercial spot loads in recent years, whereas the burgeoning popularity of the Internet among marketers has created a cluttered environment online. A campaign on radio will showcase the advertiser’s message and can direct listeners to a site. Build Trust: Radio represents a trusted source for information and entertainment among consumers; many Americans continue to exercise caution in using the Internet and believing what they read or hear online. 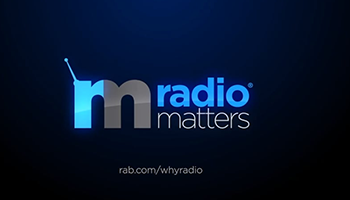 Radio adds credibility to an Internet-radio campaign mix. Enhance Recall: When radio is combined with Internet advertising, it can increase brand recall and help drive awareness. Drive Consumers to Web Sites: Based upon an analysis of over 2,100 local radio ads across 6 different categories: Radio generated an average 29% lift in Google search activity. Search as a result of radio advertising is greater on weekdays versus weekends. Radio driven search is higher during midday hours. Quality of radio creative has a direct impact on increased search behavior.